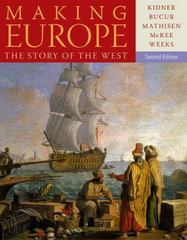 Making Europe 2 Edition Developed by a team of authors who have spent many years making history accessible to a diverse range of readers, each chapter of MAKING EUROPE begins with clear learning objectives and timelines, and continues with an accessible narrative that uses focus questions throughout the text to help all readers understand historical concepts. The "Check-In" feature and the "Test Yourself" questions at the end of each chapter help you assess your understanding of the material. The text uses stories of ordinary people and their impact on history, and visually stunning images and maps that make learning history interesting. Available in the following split options: MAKING EUROPE, Second Edition Complete; Since 1300; Volume 1: To 1790; and Volume 2: Since 1550.